Doctor shortage: Foreign doctors are just as good as the homegrown variety. So why don’t we let them practice here? They’re just as good as the homegrown variety. So why don’t we let them practice here? 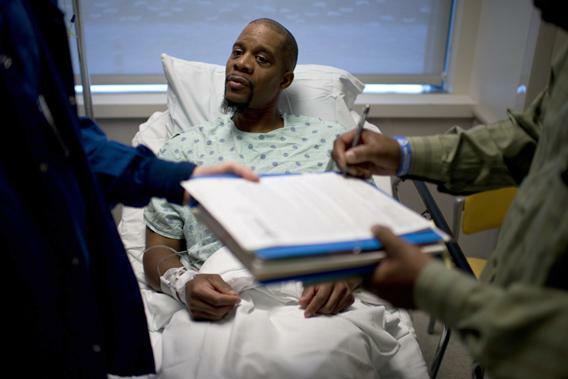 A kidney donor watches as a consent form is singed before surgery. Given everything that the United States is doing to keep foreign doctors away, is there evidence that domestically trained doctors are superior? If President Obama’s health care reform plan is implemented in its current form, the United States will face an estimated shortfall of 130,000 doctors by 2025. To put that into perspective, consider that the current shortage—which inspires much handwringing—is less than one-half that amount, according to projections from the Association of American Medical Colleges. There’s a simple solution to this problem: Import more physicians from abroad. And yet, it takes years for foreign trained doctors to earn a U.S. license. Some of the safeguards are sensible, like verification of foreign credentials and proving English language fluency. Some are not. Even if a doctor has practiced for years in her home country, she must pass the same exams as graduates of American medical schools, then repeat three or more years of residency and fellowship training. A recent New York Times article explored the bewilderment among some health care policy advocates as to why we’ve been slow to liberalize the importation of doctors from abroad. After all, we’re importing more farmhands and nurses to alleviate our shortages in those fields. Given everything that the United States is doing to keep foreign doctors away, you’d think there would be some evidence that domestically trained doctors are superior. There is none. During the 1990s, a series of studies showed that graduates of foreign medical colleges performed slightly worse on exams than their U.S.-trained colleagues, and program heads gave marginally better reviews to domestic physicians. By the turn of the century, however, that gap had disappeared. International graduates now score higher than U.S.-educated doctors on many exams. The study found little difference between doctors who were both born and trained abroad and those who trained in U.S. medical schools. Cardiac patients managed by the foreign-born and foreign-trained doctors were slightly less likely to die, but spent slightly more time in the hospital than those treated by U.S.-trained doctors. A 2005 study in Canada—the only country whose doctors need not repeat their training to practice in the United States—also showed that international medical graduates produced similar results to domestically educated doctors. Since the 2010 Pennsylvania study was limited to one state and one medical condition, it’s not going to be the end of a discussion about the quality of foreign-trained doctors. It should have at least been the beginning, though. Three years later, the call for opening the door much wider to international medical graduates is still barely audible. There was one other notable finding in the 2010 study: Doctors who were U.S. citizens, but trained abroad, produced the worst results. That result isn’t intuitively surprising. Many (but not all) Americans who go to med school abroad do so because they can’t get into a domestic school. That doesn’t make them stupid or hopeless, and some of them go on to become wonderful physicians. On average, however, they are lesser candidates, and domestic medical schools filtered them out. It’s tempting to treat these re-imported doctors as a footnote in the debate over foreign physicians. After all, the average American imagines that a typical foreign medical graduate was born and raised in India, China, or Mexico. But that’s part of the problem. A large portion of the distaste for foreign doctors isn’t based on an assessment of the quality of medical training abroad. Rather, it’s based on xenophobia, or racism. Few people would openly admit to such bias in a survey, but suggestive evidence is everywhere. Patients and their families are regularly overheard bemoaning the lack of American doctors in hospitals. They don’t mean foreign-trained doctors, since they rarely know where the attending or resident went to med school; they mean foreign-sounding or foreign-looking doctors. Other patients complain that they can’t understand the doctor’s accent, which is a slightly more politically correct expression of the same sentiment. Americans rarely reject doctors because of their German or British accents, and patients have accused more than a few nonwhite doctors who were born and raised in the United States of speaking with an unintelligible accent. In a 2007 survey, judges said juries took foreign-born and -trained psychiatrists less seriously, but an Irish brogue or British accent might be acceptable. Here’s an experiment: Go to your health insurance company’s website and look for a primary care doctor. I’ll bet many of the physicians still accepting new patients have names traceable to Asian, Eastern European, or Spanish-speaking countries. That’s the case when I’m shopping for care on my health insurance company’s website, at least. Discriminating on this basis is crazy. A few years ago, I met someone in India who was applying to graduate schools in the United States. His proud girlfriend told me that he ranked eighth in his class. I asked how many people were in the class. “Oh, that’s good,” I responded, not particularly impressed. A mutual friend, who was attending school in England, recognized my misunderstanding. Not all of the foreign medical graduates who come to the United States from India, China, and Mexico are quite that accomplished, but we are talking, in general, about a group of people who proved their academic mettle in extremely competitive environments. To turn them away because they have funny accents is foolish. Foreign-trained doctors, especially those born and raised abroad, face adaptation issues, and we need to maintain standards to prevent unproven doctors from entering. It’s reasonable to make them prove their English language skills. There should also be training on medico-cultural differences between their home countries and the United States. American doctors practice pain management, for example, somewhat differently than those in Asia. But we shouldn’t let unexamined prejudice or protectionism dictate our health care policy.